Obagi CLENZIderm M.D. Daily Care Foaming Cleanser 4oz. Cleanses acne-prone skin to help clear and prevent further breakouts. Contains Salicylic Acid. 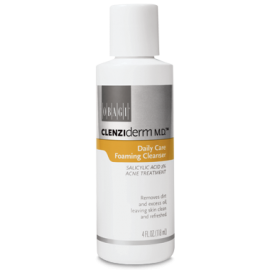 The Obagi CLENZIderm MD Daily Care Foaming Cleanser cleanses acne-prone skin to help clear and prevent further breakouts. The Daily Care Foaming Cleanser’s gentle foaming action exfoliates deep within the pores to completely clean out the acne-causing bacteria from the skin; reducing further acne pimples from forming. The cleanser contains 2% Salicylic Acid, the ingredient that fights the acne-causing bacteria by drying it up allowing for clearer skin. You're reviewing: Obagi CLENZIderm M.D. Daily Care Foaming Cleanser 4oz.